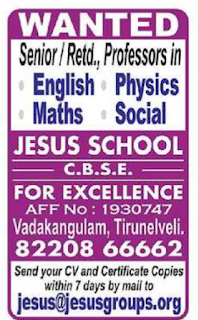 Jesus School CBSE for Excellence, Tirunelveli has advertised in THE Hindu newspaper for recruitment of senior,retired jobs vacancies. Interested and eligible job aspirants are requested to apply within 7 days from 11th April 2018. Check out further more details below. 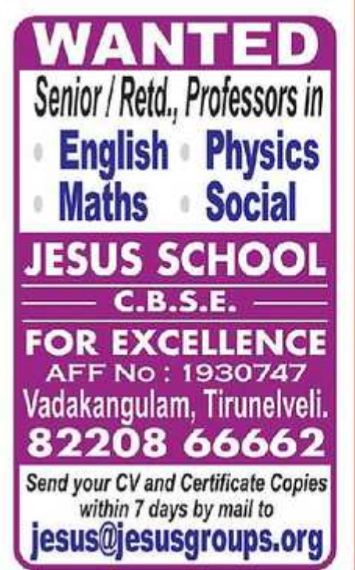 About School: JESUS SCHOOL FOR EXCELLENCE was started in the Year 2013, founded by Er.A.Jesus Raja, Chairman of Jesus group of Organizations. Smack in the midst of breezy wind and Wind mills, Jesus School gives the ideal hygienic environment for children to study, play, dance and enjoy school life. Spread over 60 acres of lush, green land under our Trust, our campus is the safest place to send your child. Fountains and sculptures adorn the grounds, while manicured lawns and tree-filled parks offer breathing room.